Sencha touch is a OOP java script library used for creating HTML5 based mobile application, that run on mobile like Android, iPhone and Blackberry and give native app-work experience (Just like a JQuery Mobile). Use below link for downloading secha touch library. 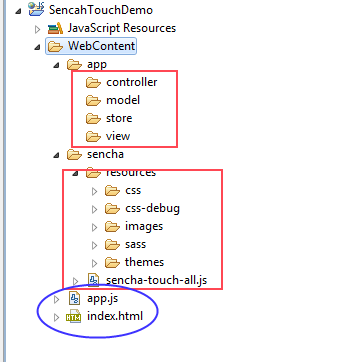 Sencha development - Basic folder structure. 1. Create a new web project using eclipse or STS. 2. Inside the web content folder, create a new folder called as 'sencha'. 3. Extract the sench library and copy the entire resources folder into 'sencha' directory. 4. 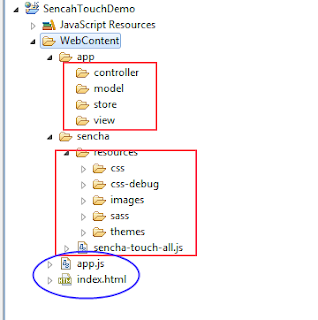 Copy the 'sencha-touch-all.js' from Sencha library and put it into 'sencha' directory too. 6. Inside the web content folder, just create the app.js and index.html file. These two files are starting point of the application. The final structure should be like this. 7. Now I am going write simple code for getting simple alert. Just add the following code into app.js file. 7. This is my html file, Here I have included all the necessary js and css files. 8. Deploy this application into any one web server like apache tomcat and open the inde.html page by using android or iphone with corresponding URL of the application. You should get alert like this.